Mango Milkshake is most popular recipe in India.The mango milkshake is one such popular shake that people love to have in the summer! It is also very easy to make, so you can whip it up any time. It tastes Yummylicious. 1) Wash ,peel and chop mangoes into small pieces. 2) Transfer them to mixer or blender. 3) Add milk ,sugar and ice cubes. 4) Blend until smooth and creamy. 5) Pour prepared shake in glasses. 6) Garnish each shake with chilled chopped mangoes or scoop of ice cream and serve. 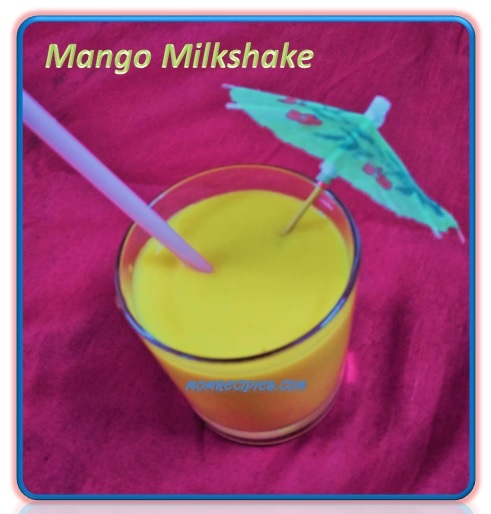 7) Enjoy the Delicious Healthy Mango Shake! 8) The drink is perfect to beat the summer heat and enjoy the best of mangoes. 1) This mango shake is so delicious it hardly requires any add on. You can have on its own plain. 2) You can garnish it with chopped almonds or chopped Pistachio nuts. 4) Garnish the Shake with Vanilla Ice cream. Instead of fresh mangoes you can use canned mango pulp also. If mango pulp is sweet then skip the sugar.